With all the snow so far this winter the prospects were more than promising for our first off piste weekend of the winter. As usual, the weekend was hosted by James P-T and we had two great guides Thomas and Hans-Michel to show everyone the way and offer tuition as required. The team were split into 2 groups with Thomas taking the girls group and Hans-Michel the men. 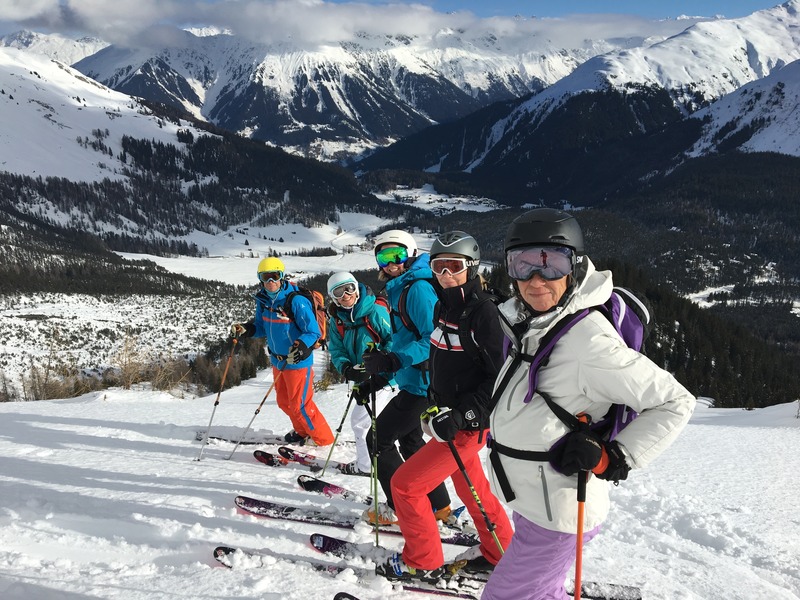 This is the first time we have had an all girls group on one of our off piste weekends and it proved incredibly popular. The girls felt much more relaxed and less pressurized than if they were in a mixed group, allowing them to develop their off piste skills at their own pace. Additionally, James accompanied them when the skiing got more challenging to go at the back and lend reassurance (the last skier in the group did not then have to worry about what would happen if they fell over and lost a ski). We will definitely try and have a dedicated girls group again next year, or possibly even a girls only off piste weekend. Everyone congregated at Gotschna Sport (surely one of the best rental shops in the Alps for off piste kit!) on Thursday morning to get kitted out and then it was off to the Madrisa to find the powder. In actual fact it had not snowed for nearly a week, and then it had been very mild and especially windy. Nonetheless Thomas and Hans-Michel managed to find great snow for everyone to ski on both Shafcalanda and Chuecalanda before both groups went over the top for a wonderful long descent in untouched snow down to the pretty little village of St Antonien for a very late lunch. It was a brilliant first day. The weather on Friday was not as friendly as forecast so everyone headed up Gotschna. This was a good day to focus on technique and the iPhone is a great training aid for those who want video analysis and instantaneous feedback. This primed everyone for Saturday when the sun came out. This time it was the Rinerhorn that was to be the playground of the day and again it was remarkably untracked. There was plenty of fresh snow on the slopes down the front and after coffee, the team were introduced to what for most was a new experience... ski touring. The skins were adopted and it was a short 20 minute hike from the top of the Nullisch lift to the col from where there was a gorgeous descent down to the hamlet and restaurant at Muhle. Sunday was unfortunately the last day and again the weather was glorious. Thomas and Hans-Michel treated their groups to one of the area's most iconic runs, the Directissima. This is a huge slope off the back of the Weissfluh Gipfel where the skiing just seems to go on for ever and ever. This also involved using skins for a short walk out from the bottom, but of course everyone was an expert at this by now. Everyone managed to pack in an enormous amount of skiing in their four days on the slopes. Moreover all the guests improved enormously allowing them to ski slopes on the last day that just would not have been possible for them on their first. All credit goes to Thomas and Hans-Michel not only for their great tuition but also for finding such good snow in really very tricky conditions. As has been the case for all of this winter so far, the snow clouds have returned paving the way more fresh tracks for those lucky enough to be heading into the Klosters back country.